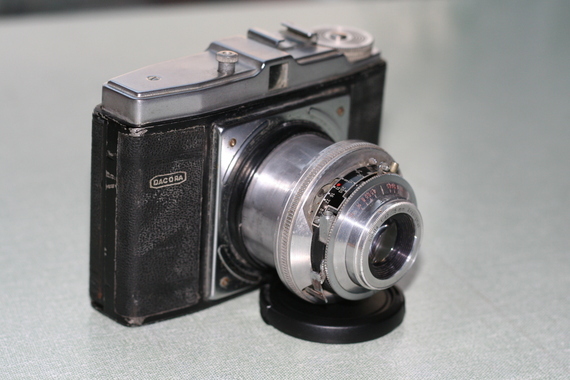 This is a very cheap camera from the mid 1950s. It takes 120 film (12 negatives to a roll) which was more-or-less standard for amateur photographers at the time. The Digna came in several versions and my example is, apparently, close to the top of the range. The camera is fairly small for a medium format camera - 130mm wide, 90 mm tall and 70mm thick when closed - and also relatively light. The camera has to be opened before use, but not by extending bellows. You turn the lens very slightly clockwise and the lens pops out on a spring. The shutter on my example is a Gauthier Vario shutter - 1/25, 1/75 and 1/200 seconds and B. As I say, this is the upmarket version so I dread to think what the lower end of the range had for a shutter. The lens is a Subito f4.5 75mm lens - a make I have never heard of before. As I have no intention of putting a roll of film through this camera, I shall never know how good the lens is (or not). The lens focusses from 3.5 to infinity (I assume that is in feet as 3.5 meters would not be very usable as a near focus. There are two happy snapper settings both at f10 - nine feet and around thirty feet. At the nine feet setting, the depth of field is from seven feet to fifteen feet, and and the thirty feet setting the depth of field is fifteen feet to infinity. Those two happy snapper settings are going to be quite useful. The snap-shotter can keep the focus at the near happy snapper setting continually if he usually takes shots of people and at the far setting if he usually takes shots of landscapes. To open the camera, the back comes away completely - no expensive hinge on the side away from the catch! There seems to be very little holding the back in place, but it is quite secure. The spool carrier for the new film hinges out for ease of loading, and the take-up spool carrier is partially hinged. For a cheap camera, this is very good and easy to use. When the back is removed, the mechanism for the pop-out lens is exposed - it is not at all sophisticated or complex so no worries about damaging it. In fact, I was easily able to apply a few drops of clock oil to the moving parts and thus allowed the mechanism to work as if new. The finish is very poor. It would seem to be nickel plated mild steel and aluminium. The main body seems to be die-cast aluminium with just the top plate and back being mild steel. There is rust coming through the nickel plated portions and there is no evidence of anodising on the aluminium and it was rather corroded on my example. There is the normal red window on the back to view the frame numbers and there is no blanking mechanism so the film could become fogged eventually if the camera is left in the light. I am unable to say how the camera feels in use as I am not going to actually use it. However, it fits in the hand very well and is ergonomically designed - the viewfinder and shutter release are both where you would want them to be. In fact, the basic design is fine, it is just the poor standard of manufacture that lets this camera down.